The area of straw bourrelet hat making is rather a mystery. Let’s begin with what may have been the inspiration behind the evolution of this hat of straw. 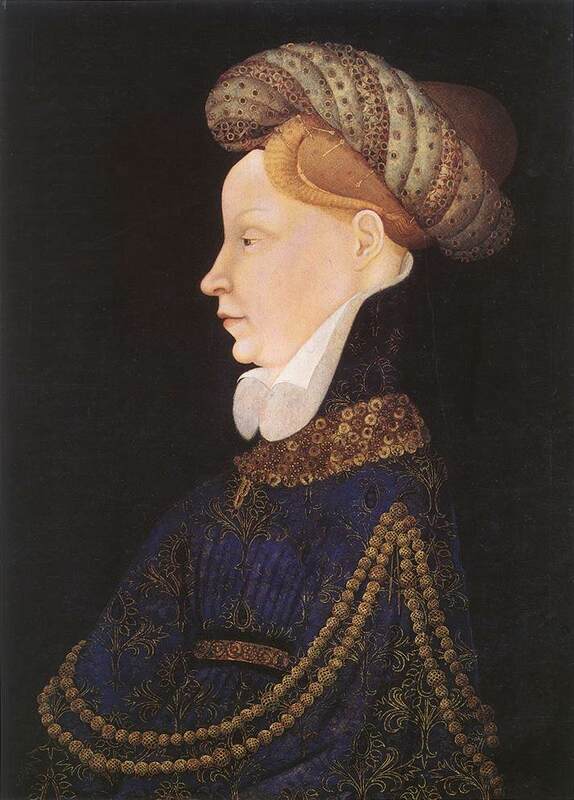 A bourrelet, or “padded roll” hat, was fashionable in the 14th and 15th centuries. These hats were made principally of rolled fabric. From the National Gallery of Art, Washington, is an example of a bourrelet hat found in a painting dated 1420. Unfortunately the artist is unknown. After the 15th century, adult headdress styles changed, as they do, and the rolled piece was fashionably replaced with something more relaxed. Instead of disappearing altogether the padded rolled style headdress made its way to children’s wear. The safety of toddlers has been a worldwide concern as long as there have been children. There were plenty of ways for a child to seriously injure their heads. Their environment was dangerous. The flooring in their home would have been unforgiving if a child bumped their head or fell. 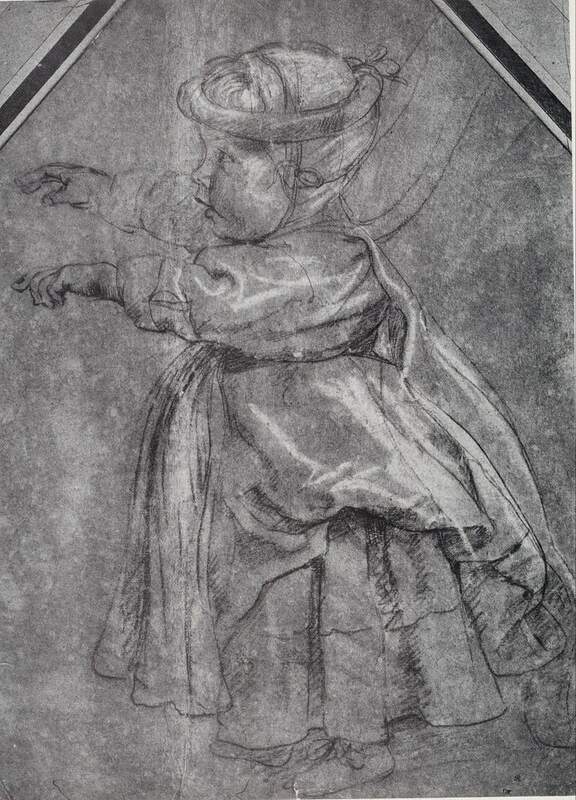 We see our first historical example of a head protection hat specifically for a child in a pudding cap drawing by Peter Paul Rubens, dated 1620. The tubular, pudding shape is apparent. No doubt fabric stuffed into a roll shape. Our next example is seen in this sepia-tone drawing by Rembrandt, dated 1645 below. The child is being held-up by the adult by leading strings. 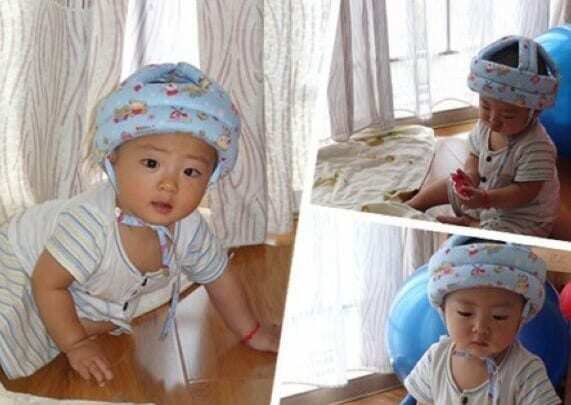 The child’s head is protected with seemingly a rolled pudding shaped hat. The adult’s head covering is but a simple scarf. 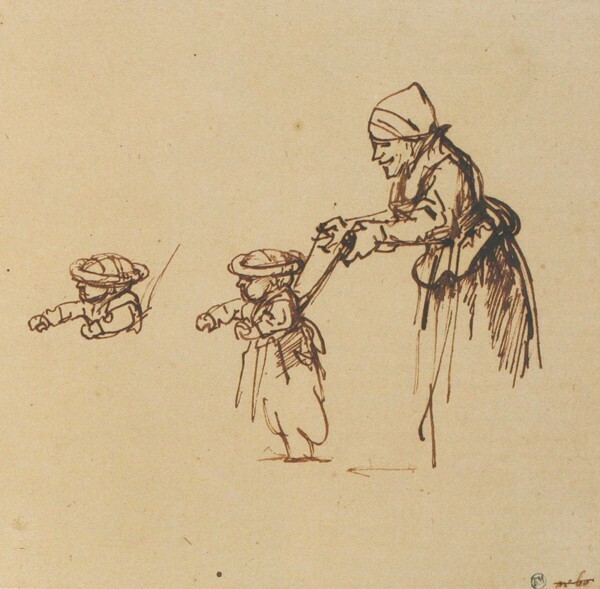 The emphasis of this drawing, to The Straw Shop, is that the protected child’s head hat has been sketched twice. 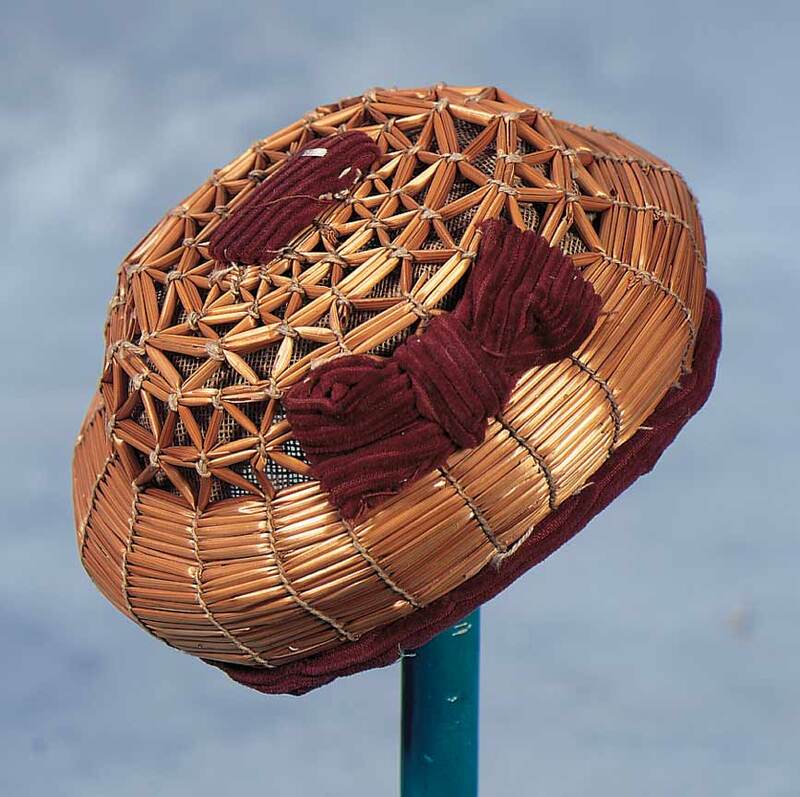 There are several examples of child protective bourrelet hats held in museums. The hats range in a variety of materials; such as leather or assorted fabrics and silks. At some point the straw bourrelet hat appeared. 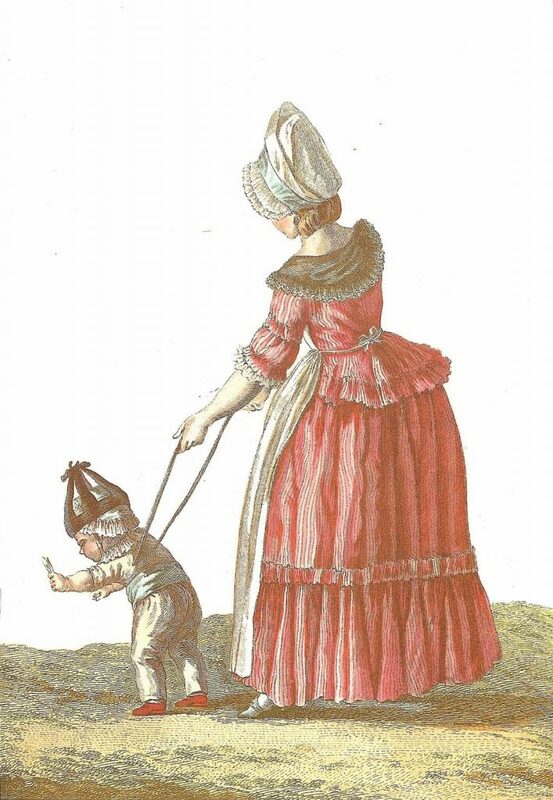 The straw bourrelet hats that developed over time for infants and toddlers were curiously similar in their design and construction. The hats all still maintained the pudding roll shape. The straw hats are all hand tied with each having their own style of starting point. 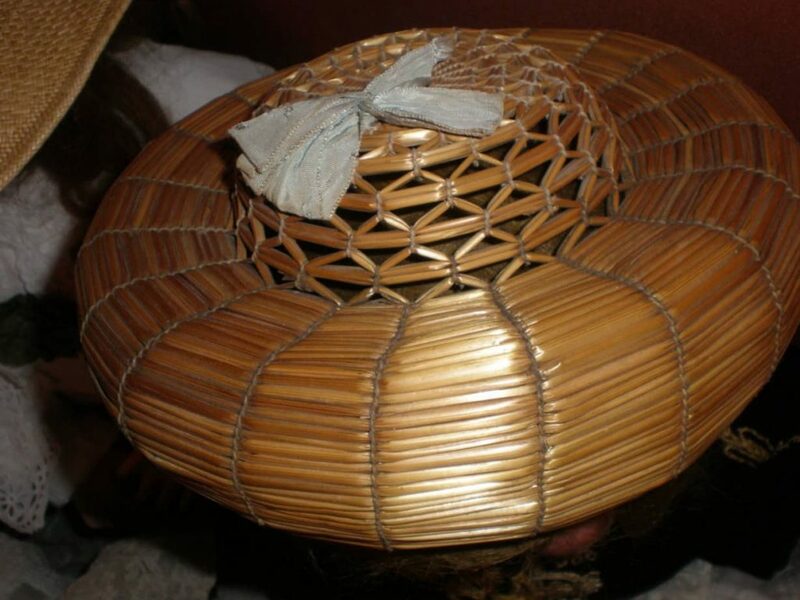 The straw hats all provide a strong straw structure creating a “crumple zone” or buffer between the delicate skull and any impact from a sharp edge or hard floor. The straw bourrelet hats are known by names such as a pudding roll (England), baby helmet, Bourrelet ( French), Chichonera (Spanish for helmets). Today, among collectors, they are often called simply straw bourrelet hats. None of the straw bourrelet examples The Straw Shop has seen have been marked or tagged in any way as to identify origin; maker; or date. The Straw Shop acknowledges Theirault’s Antiques for their images and dated information their research has provided. 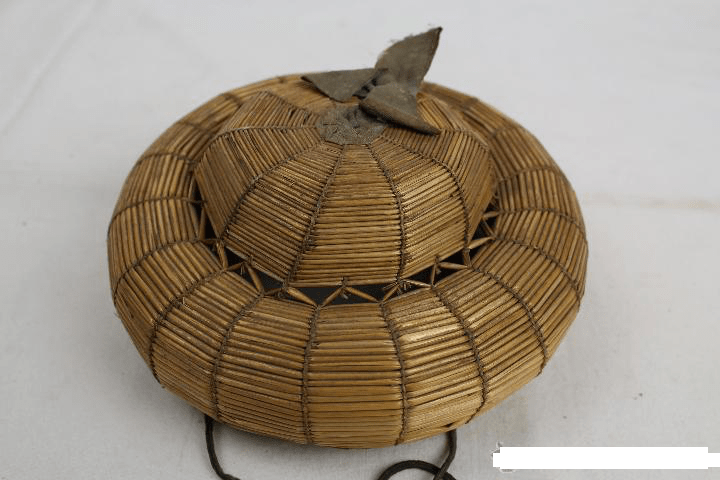 It is claimed by various researchers these straw bourrelet hats were popular during the 19th and 20th centuries in France, Spain and Belgium. Today when searching for these straw hats they are most often being sold or attributed to being a doll’s hat. Rightly or wrongly, the transition from a child’s protective hat to a doll’s hat has occurred. In fact, many of the hats sold today as doll’s hats may have originally been made for a young child. The bourrelet shown below is unusual due to the decorative chenille applied to it. As the example has a circumference of 18 inches, it is more likely it was originally made for a child. The hat shown below was purchased in Spain. The age and maker are unknown. The round hole in the top of the hat differs from the oval shapes found on other straw bourrelet hats we have shown here. This is quite typical for the style we have seen produced in Spain. The hat below is 6 inches in diameter. Another commonality these hats have is they appear to be all hand tied. The straws, when needed to be added, are hidden below the tie on each row. The method, curiously, is the same as that used to make Yeddo hats. 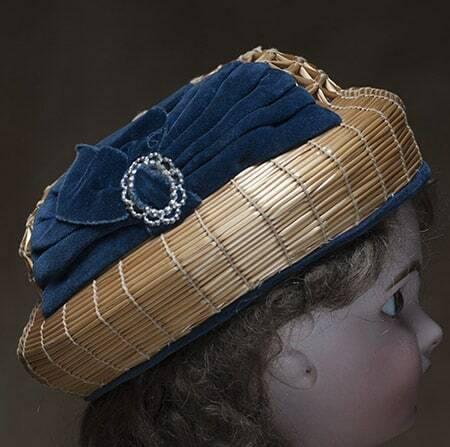 Described as French from 1860 the two hats are decorated with dark blue chenille. These hats are rather rare as their size is 2 1/2 inches wide. They are thought to have been made specifically for dolls and their size also indicates this is accurate. The hat with its blue velvety ribbon may have very easily began as a child’s hat that was later decorated when applied to a doll, or was the hat originally intended as a fashionable child’s hat? 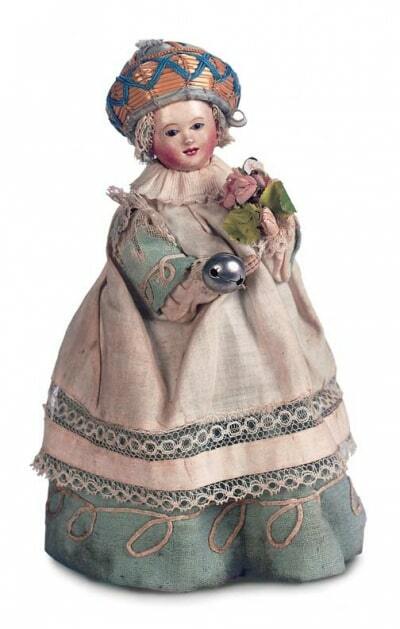 This pretty doll, circa 1885 is described as French. The decorated style of the straw bourrelet hat is very similar to two more examples shown below. The 18 inch tall French doll dressed in blue, shown below, is attributed to Andre Thuillier, circa 1882. It would be interesting to know if the hat was originally part of the doll’s costume or if it was later added. 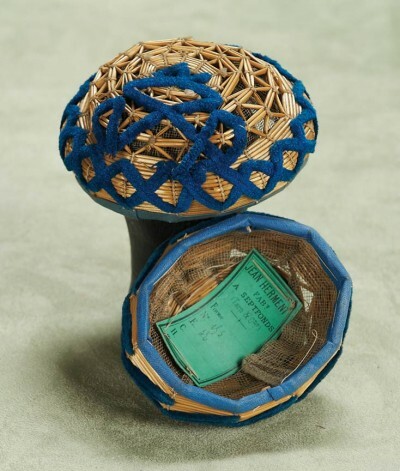 Despite the date of the dolls then, until the question of original costume and components to any of the dolls is answered, their manufacture dates, with respect to dating the straw bourrelet hats, specifically are irrelevant. If the doll’s costumes were completely documented when the doll was first manufactured and sold, then and only then could the hats be somewhat dated. 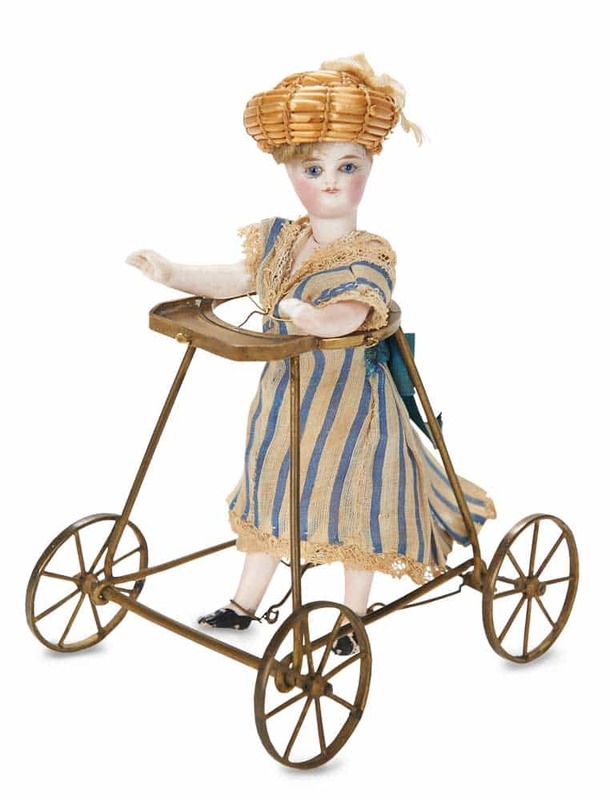 This little 8 inch tall toy doll with a rattle was made by Theroude,circa 1855. 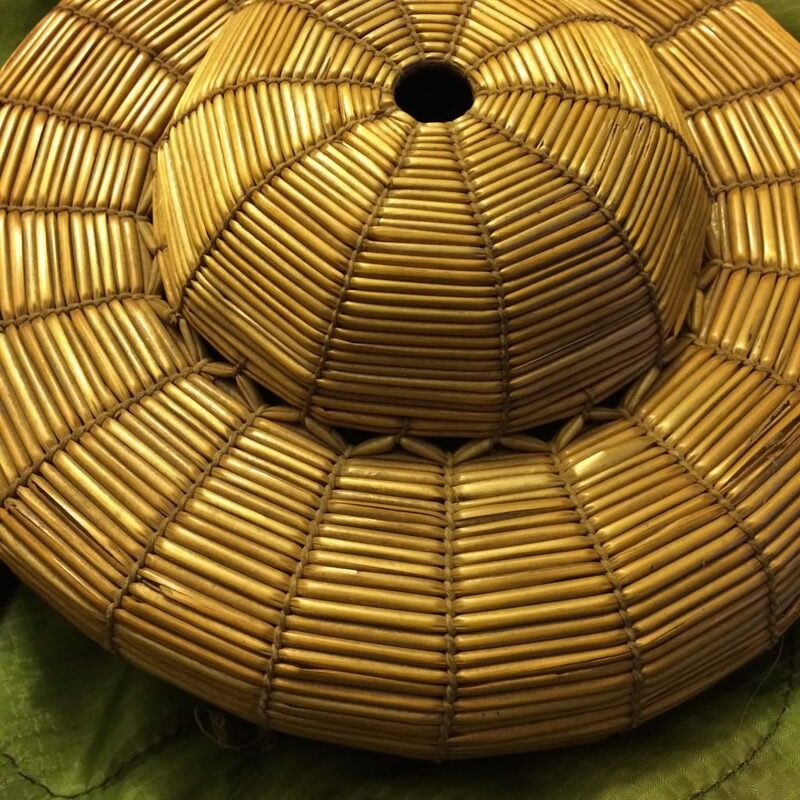 To our knowledge, the most recent country to produce straw bourrelet hats is Spain. In Spain they are called chichonera, or helmets. In Catalonia, where doll sized straw bourrelet hats are produced today they are called Caps Cop. The below image is an example of a Caps Cop. 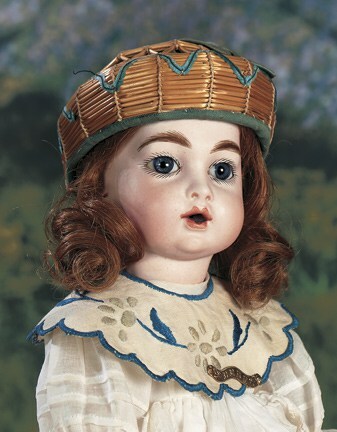 Straw bourrelet hats are now quite collectable in the doll market. The Straw Shop is again grateful to the many images from Theriault’s.com. The photograph below shows toddlers in China today. 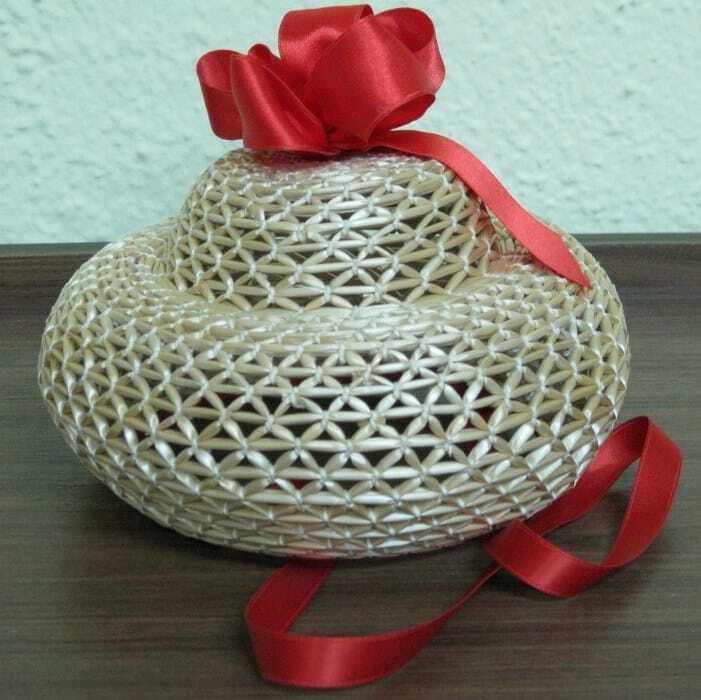 Although the straw has been replaced with padded plastic, the hat’s shape and purpose remains the same as it was in 1620. The Straw Shop welcomes additional information on this subject.